This exercise is designed to help you understand how to construct drawings from given dimensions and how to use the various drawing and modify tools to create new drawing elements. The illustration above shows the boundary of a development site and two office buildings. All dimensions are in metres. 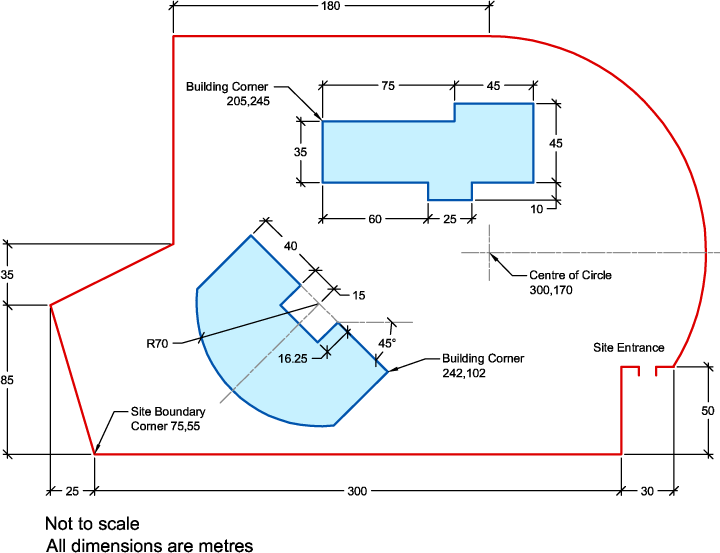 Use the dimensions and co-ordinates to accurately draw the site boundary and building footprints (you do not need to draw the dimensions, these are for information only). Think about layers. Perhaps you should use one layer for the boundary and one for the buildings. There are an infinite number of ways to construct this drawing; there isn't a right way or a wrong way. Use the draw and modify skills you have already learned to construct the drawing in the most logical way. If you get stuck, have another look at some of the tutorials. The Drawing Objects and Modifying Objects tutorials contain lots of information that may help you. There are lots of tools that can help you complete this drawing quickly and easily. Consider using Direct Distance Entry and Polar Snap or even Object Snap Tracking. Hint: start at the bottom-left corner of the site boundary. When you have completed the site layout, you can have some fun. You need to add a road to the site for traffic circulation. You also need to add a lake, an area for car parking and some trees.